Valley News by clicking here. I grew up in New York City, in awe of the tall buildings and the orderly grid of streets and avenues. My first exposure to fine art was at the China Institute on 65th Street where I attended Christian church services with my parents. There, surrounded by the intense color and abstract forms of ancient Chinese ink paintings and porcelains, I became aware of universal art. During the following years, I experienced many other art forms firsthand – from the ancient to the contemporary – through my travels to Mexico, South America, the Far East and Europe. As a self-taught artist, I was fortunate to have met many artists who were very helpful to me by introducing me to the art world and nurturing my creativity. Among them were the sculptor Michael Lekakis and his friend, painter Harold Weston, in whose company I began to love the conversation and the history of art. It was Harold Weston, creator of the legislation for the New York State Council on the Arts and the National Council on the Arts, a precursor to the NEA, who bought the first painting I sold. The colorist painter Herb Aach instructed me in the technical aspects of acrylic painting. My first exhibition, of abstract paintings, was in New York City in 1965 at the DeMena Gallery. Subsequently, I showed my work in galleries and museums in Mexico City, Finland, Germany, The Netherlands, Sweden, and throughout the United States. My most recent one-person shows were at Sterling College in Craftsbury Common, VT.
To celebrate the Helen Day Art Center’s 20th anniversary in 2006, I curated the exhibition, “Vermont Collections”, art works selected from 17 public collections. 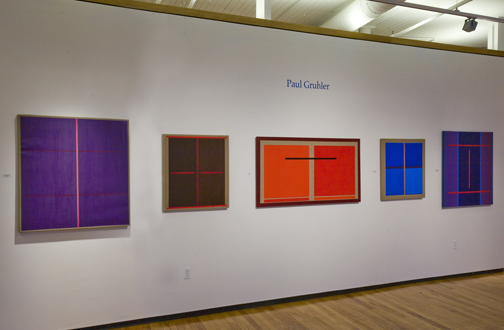 From 2008 through 2011, I curated “The Art of Vermont: The State Collection”, a series of exhibitions that is traveling to ten museums and art centers across Vermont. These installations are funded by the Vermont Arts Council through an NEA grant, and the State of Vermont. My studio and home are in Craftsbury, VT.